Owing to our vigilant and industrious workforce, we deal in the Trading and supplying of Mounted Points. These points are fully customizable and are manufactured at par with the set industry standards. Further, these points adhere to the industry code of conduct and are specially reputed for its precise functionality. Finally, these mounted points have economical prices and do not require much maintenance. We�supply unmatched quality mounted points in A, B & W groups with 3mm/6mm spindles.�Our mounted points are used by many reputed industries throughout the world. All the reliable mounted points are supplied at affordable prices to suit each user's budget. 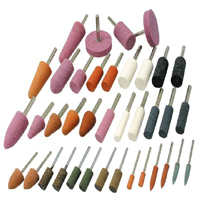 These abrasive mounted points are designed and developed by highly qualified professionals.